Alan Schuckman, a Bishop Carroll graduate, coached his alma mater for 22 highly successful seasons. When Schuckman was in high school, he remembered facing Scott Vang, a highly touted lineman at Wichita Northwest. Vang played college football at University of Iowa. However, Schuckman and Vang have enjoyed many conversations about football, coaching all aspects of a team and building a program. Schuckman, who retired this past year after 21 straight winning seasons and two state titles, and successful Derby coach Brandon Clark have had a significant impact on Vang. On Friday nights, Vang had long struggled against the premier programs. Now, Vang has vaulted Goddard to marquee victories against Carroll and Derby in the last year. Vang finished 13-43 as the Wichita East head coach from 2001-06. He received another opportunity at Goddard, a program with little recent tradition. The Lions won fewer than 10 games combined in Vang’s first three years. Since then, the Lions are 6-4, 11-2 and 2-0 this year. Last fall, Goddard defeated Carroll, 20-12, in the Round of 16 playoffs. The contest marked Schuckman’s final game as head coach. From ’12-14, Carroll had defeated Goddard 70-13, 48-0 and 67-0. Last season’s playoff win against Carroll was the first even victory against the Golden Eagles for Goddard offensive coordinator Tom Beason, a former Wichita North head coach. Then, Goddard beat Wichita Heights and Great Bend. In the 5A title game, The Lions lost 35-34 in double overtime to Mill Valley. Last Friday, Goddard rolled Derby, 50-20, and ended the Panthers’ 24-game winning streak. From Derby, Vang has seen that Clark, who has captured three 6A crowns in the last four years, has great community support and involvement with his players. Goddard players work each field day at the elementary school and have helped a domestic abuse survivor move. Derby, with 75 on the roster, platoons. Vang has just 49 out but has looked to have a similar approach. Vang has talked to Clark several times and has dual-threat quarterback Blake Sullivan in a similar mold to Derby standouts in recent years. Vang and Schuckman have known each other in the coaching fraternity for around 20 seasons and grown close in the last 10, especially at the summer camps. Schuckman said the coaches rarely talked Xs and Os. “That’s what the profession should be about,” Schuckman said. “It’s about helping each other. We are all educators, and we are all trying to make these kids better. Better people, better players, better programs, better in our community. People we end up working with through the summer are people with those same common values. At Carroll, Dusty Trail and Jim Nance served as longtime offensive and defensive coordinators, respectively, while Schuckman generally coached the offensive line and handled the head coaching responsibilities, which ultimately built a better, tight-knit program. Goddard went through a similar change in 2015. Beason handles the offense, Darrin Fisher coordinates the defense and Matt Busby serves as special teams coordinator. “Then you just have to put your pride to the side and let everybody do their job, and I will tell you the guy that had the hardest time with that is me,” Vang said. Vang has the head coach responsibilities and coaches the offensive line. McSwain labeled the coaching as the biggest key to the turnaround. “It has been nice, because now that we have a coach for each positional group, we have more time to spend on individual group time to better our skills and prepare for each team,” he said. 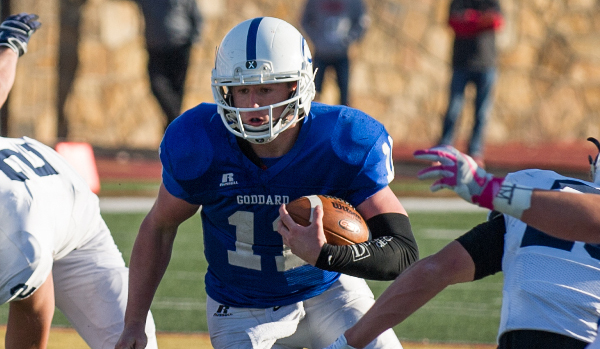 Before ‘16, Goddard started 6 a.m. summer workouts. The Lions had speed and strength training, took a break to eat and then went back and lifted again. In Week 2 last fall, Goddard lost to Derby, 35-6, on a hot, humid night that ended at halftime because of weather. Vang called the loss “the turning point.” While Derby held the advantage with schemes and talent on the edge, Goddard matched the Panthers’ physicality. Last season, the offensive average jumped from 33.9 points to 40.9 points a game. The defense had a significant improvement from 21.4 points permitted per game to 16.6, tops in 5A. Goddard was minus-2 and minus-3 in turnover margin in ’14 and ’15. Last season, the Lions forced 35 turnovers and finished plus-17. Vang said the turnovers gave Goddard’s offense “a lot of short fields” and came up with big plays, especially a 100-yard pick-six against Carroll. Goddard reached the state title for the second time, first since ’88. The Lions fumbled just short of the goal line in overtime and missed an extra point in double overtime. Vang was pleased no one pointed fingers. As Vang prepared to speak postgame, standout defensive end Cale Davidson, now at Wyoming wrestling, jumped up and said he “wouldn’t want to be a part of another team.” Vang thinks of the loss at least once a week. The coaches used the defeat as motivation throughout the summer. Goddard returned plenty of talent, especially nine seniors who were elected captains. “The whole mindset, the whole set of expectations have definitely changed,” Schuckman said. Vang has known Sullivan since little league days. In ’14, Sullivan flashed talent and played freshman quarterback. Then-junior Kyle Young served as signal caller. Sullivan did start the Carroll playoff loss. It became clear Sullivan was the long-term solution under center. In ’15, Young became a two-way starter at defensive back/wide receiver. Sullivan has posted back-to-back 1,000-yard rushing/passing seasons. Against Derby, he escaped a sack and threw a touchdown pass. He has accounted for 86 career scores. This season, he has completed 21 of 35 passes for 355 yards with a 6/0 TD/INT ratio and rushed 35 times for 295 yards and five TDs. The veteran, standout offensive line features seniors A.J. Vang, Aaron Valentine, Chod Morrow and senior tight end Owen Beason as returners. Senior Jacob Mondragon and Jeremiah Crawford start up front, too. “They like competing, and they like to kind of take the will out of you,” coach Vang said. Vang and Morrow are three-year starters, along with senior defensive back Cole Caraway. Vang calls senior Justin Amaro possibly the state’s best linebacker. McSwain returns at free safety. Mondragon, starter at nose guard in ’16, has moved to defensive end and replaced Davidson and standout Ethan Wright effectively. It’s a group that has allowed Vang to rise to the top of Kansas high school football – and emulate programs he has watched for decades.